Dried corn has never struck me as something that's refreshing on a hot day. But, unexpectedly, I found myself facing a recipe for just that. 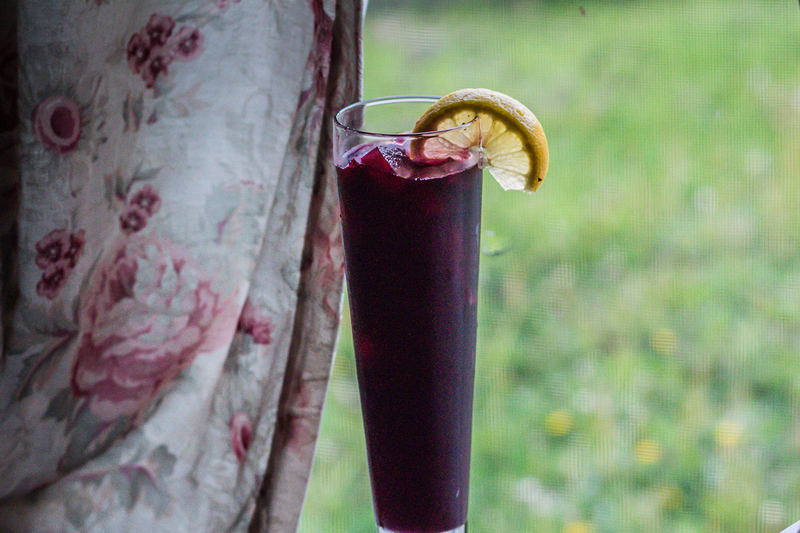 Chicha Morada, is a curious drink from Peru, brewed with dried purple corn, fruit, and spices. It's the most simple thing ever - take purple corn (the recipe on my package just said "half a bag") and boil one hour with three liters of water. Then add an apple, pineapple husks, lime juice, cloves, and cinnamon. Boil for 10 more minutes. Sweeten, garnish with more pineapple or apple, and chill. It's crisp and refreshing from the acid of the fruit and citrus, but not at all starchy or heavy. I first worked with purple corn as purple corn meal, while visiting my parents in Arizona. I originally bought this bag of purple corn to see how it would work in stewing with yucca and pork, but the recipe for Chicha Morada printed on the side was something of a distraction. After boiling the corn for an hour, I chopped some of the purple kernels open. They were totally dry. It seemed like the water had just leached the coloring from the surface of the grain. But it made sense - you need to soak cracked dried corn for 4 hours or more, so I imagine whole kernels would require a full overnight soak, like beans. Which made me curious- why did people make this corn drink? Sure, a fully-soaked corn kernel would make for a starchy and less refreshing drink. Probably closer to porridge than a summertime cooler. Was it just for the novelty of the color? Unfortunately, I don't know and haven't found much out. South America is full of drinks made from corn, both alcoholic and non-alcoholic. Any reference I've found to this purple corn drink always remarks that it's not fermented to be alcoholic. One site ties a rise in the drink's popularity from recent findings on purple corn's health attributes. But this is also the only site that refers to Chicha Morada as an alcoholic drink, something that contradicts every other reference to Chicha Morada I've found. In looking up purple corn's health benefits, I came across a company that is trying to market a proprietary purple corn hybrid here in the U.S. So mostly noise, no real facts. Like an itch between your shoulders, I just couldn't let this idea go. Why boil corn for an hour, when all it would do would dye the water? It hadn't penetrated past the outer layer of the corn, so I imagine most of the nutrients and calories wouldn't be extracted. Was it just a use for old, dried-up corn that had sat over the winter and was no longer viable as seed? 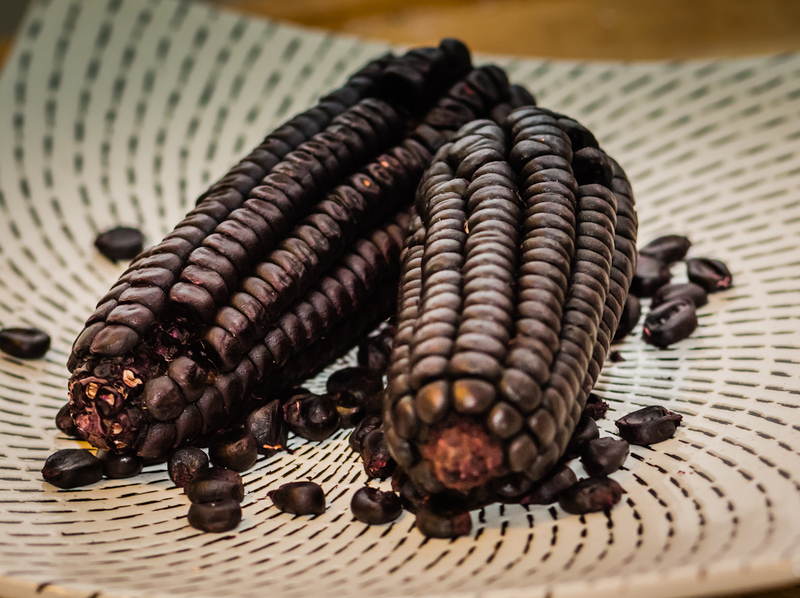 Of all the corn-based drinks that were fermented, why was this purple drink never fermented (supposedly)? I found that the best way ,since the corn is always dried and have asked her as to why no one buys fresh, she has no answer. Back to my way of making chicha, I put the corn with cinnamon sticks usually 3 and about 8 cloves into a 3 quart slow cooker and cook on high for 4 hrs , usually at this time the mixture is then boiling and about half of the kernels have popped open. I then wait for the mixture to cool abit , usually by taking the pot out of the cooker and let it cool about 15 mins, then I strain., and add 1 squeezed lime, my son likes sugar ,but my wife likes it natural. It is very tasty, and I am able to use the corn for a second batch , but that batch has to cook about 5 hrs, at which time all the corn has popped open . I at first made the chicha using the stovetop method , but always found that the second and third batches always tasted better, because the water was penetrating deeper , so that is why I first tried the slow cooker.